A strange afternoon in Newry ended with Down winning their first home game of this year's Allianz League campaign but it was all too little too late with the action elsewhere condemning them to a second relegation in three seasons. Meath's win over Louth in Drogheda meant there was to be no last day drama for Eamonn Burns' side, who avoided relegation from Division Two in the final round last year, but fell this time to the third division for the first time since 2009. Having watched promotion to Division Two, their sole spring target, elude them in Cavan last Sunday Tipperary travelled north with a makeshift, disinterested team. Liam Kearns took the opportunity to run his bench giving starts to Stephen Murray, Luke Boland, Kevin Fahey, George Hannigan and Kevin O'Halloran and they were on the backfoot from the first minute. Kevin McKernan won the throw-in, drove the ball in long to Donal O'Hare who won it and rounded his man, crossed it into the square where Sean Dornan was waiting to drill the ball into the roof of the net after just 14 seconds. Tipp did draw level through Josh Keane and O'Halloran frees before Jack Kennedy's stylish point off the outside of his boot. They were level again at 1-1 to 0-4 midway through the half but the second quarter was completely dominated by the home side. With news filtering though from Drogheda that Louth were beating Meath, Down were the only team playing with any sense of urgency. They punched roles straight through the heart of the Tipp defence, Conor Maginn, Peter Turley and Caolan Mooney picking off easy scores. Down led 1-7 to 0-6 at half time but it should have been more. Five wides were part of the reason with Tipp, struggling to string more than a couple of passes together, lucky not to escape further punishment. Michael Quinlivan's '45' and Kevin Fahey's point just before the interval were Tipp's sole points in the 20 minutes before half time, though they did at least have a strong breeze at their backs to come for the second half. Liam Kearns had seen enough by the break and brought on Stephen O'Brien and Conor Sweeney for the second half. O'Brien had an immediate effect in midfield and within 15 minutes of the second half, Tipperary were ahead. 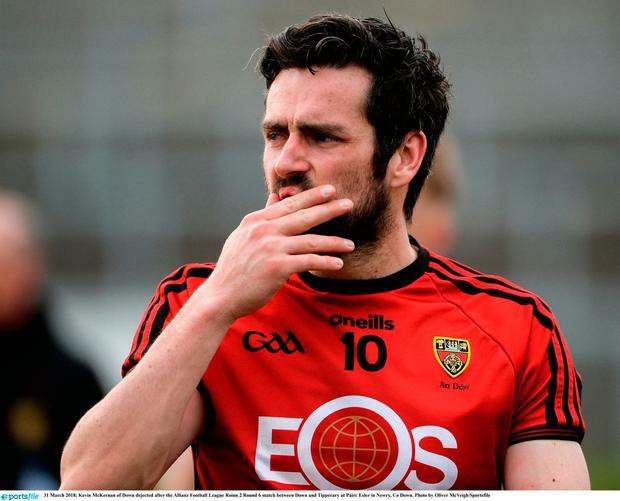 Sweeney and Jack Kennedy frees ignited the fightback with Quinlivan tapping home a scrappy 48th minute goal, after O'Brien failed to connect properly with his fist. Kennedy's second free edged Tipp in front for the first and only time, but Down settled things down after a ropey third quarter. Donal O'Hare converted a penalty after Maginn was fouled in the 54th minute and they closed the game out in the closing stages, Tipp losing captain Robbie Kiely to a second yellow card five minutes from the end. Scorers for Tipperary – Michael Quinlivan 1-1, Jack Kennedy 0-3 (2f), Conor Sweeney 0-2 (1f), Kevin O'Halloran 0-2 (1f), Kevin Fahey 0-1, Josh Keane 0-1 (f). Scorers for Tipperary – Michael Quinlivan 1-1, Jack Kennedy 0-3 (2f), Conor Sweeney 0-3 (1f), Kevin O'Halloran 0-2 (1f), Kevin Fahey 0-1, Josh Keane 0-1 (f).